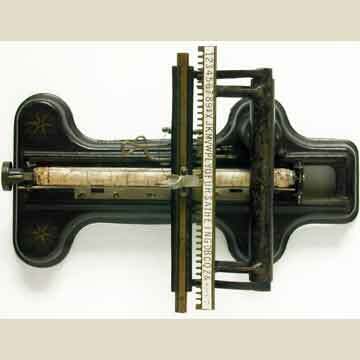 Lee Burridge (see History/Inventors) patented his Sun index typewriter in 1885. The mechanism of the machine is remarkably similar to the Odell typewriter that appeared four years later, patented by Levi Odell. The Sun index appeared in three models between 1885 and 1888. The first two were placed on a wooden base. The third one (presented here) had a dog-bone shaped metal base. It is interesting to note that there are so many similarities between this machine and the Odell, that coincidence seems to be very unlikely. The straight type bar, the handle on top of it, the spacing mechanism (pic 6), even the order of the characters on the index was used on the Odell. The Sun Typewriter Company moved on to a higher echelon of the market by 1901, when Burridge's Sun Standard typewriter was introduced (see keyboard typewriters).